THARIEN SMITH BIO: Tharien is fascinated with perspective, chiaroscuro, Fibonacci sequence, and an avid admirer of nature. She graduated with a National Textile Diploma from TUT i, Pretoria, SA She has spent most of her career working in various creative corporate environments, designing everything from furnishing fabrics to fashion, graphics and ceramic tiles. 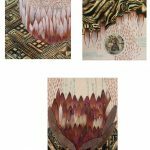 The artist resides in Cape Town combining skills to create beautiful artworks and textile products spanning across multiple mediums. Tharien is busy building her own range of products, which includes, Art, jewellery, cushions and hand painted fabrics. ARTIST STATEMENT: There isn't a manual to being an artist, and there isn't a manual for being alive. Obstacles and challenges throughout life are inevitable. For me being creative means taking risks and ignoring doubt and facing my fears. We think with our hands as much as our brains. Creating is a type of meditation, an active training of the mind that increase awareness and emphasizes acceptance of feelings and thoughts without judgment and relaxation of body and mind. I express myself thru my art, it is in many aspects an extension of who I am. I am an observer, giving the viewer a ‘slice of life’ be it an emotion, a situation or a moment in time.